Rotorcraft shipboard landing continues to be challenging due to increased pilot workload in dealing with effects of ship air wake turbulence on vehicle motion and random ship motion. Some of the recent work has proposed a pilot assist function for reduced pilot workload using model predictive control methods. 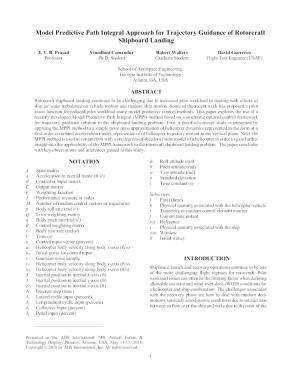 This paper explores the use of a recently developed Model Predictive Path Integral (MPPI) method based on a stochastic optimal control framework for trajectory guidance solution to the shipboard landing problem. First, a proof-of-concept study is presented by applying the MPPI method to a simple point mass approximation of helicopter dynamics represented in the form of a first-order command acceleration model, representative of helicopter trajectory motion in the vertical plane. Next, the MPPI method is used in conjunction with a six degrees-of-freedom linear model of a helicopter in order to gain further insight into the applicability of the MPPI framework to the rotorcraft shipboard landing problem. The paper concludes with key observations and inferences gained in this study.